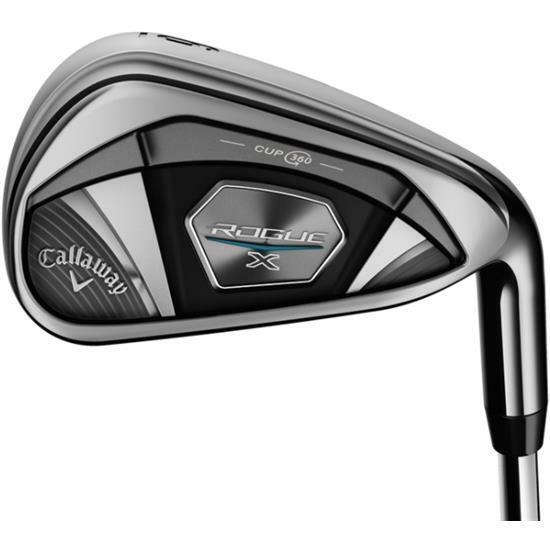 The Callaway Golf Rogue X Irons are a perfect fit for golfers looking to maximize distance. The Rogue X differentiates itself from the standard Rogue irons with stronger lofts, a reduced weight and longer total length. To ensure the clubs sound and feel, Callaway has included urethane microspheres in the head to absorb without sacrificing distance-boosting face flex. For an optimal launch, Callaway used high-density tungsten in the face to keep the CG low and deep. Injected tungsten allows for precise CG placement through the entire iron set range, giving golfers the exact launch and control they need. One of the main features in the Rogue X that promotes ball speed is Callaway's 360 Face Cup Technology. This is a single piece of metal used for the club face, which allows for increased flexing at impact. To consistently deliver higher ball speed, the Rogue X also uses Variable Face Thickness which dramatically expands the sweet spot for better contact on mis-hits. These two technologies combine to form an iron with one focus: getting golfers closer to the pin. You are about to post a review for Callaway Golf Rogue X Graphite Iron Set based on your knowledge of its playability. This review will show up under all variations of Callaway Golf Rogue X Graphite Iron Set, including new, personalized, and custom logo.